Three rooms adjacent to the cloister of the Royal Monastery of Pedralbes show how the scientific study of the frescoes of the Chapel of Sant Miquel, on the other side of the cloister, was undertaken in advance of their restoration. 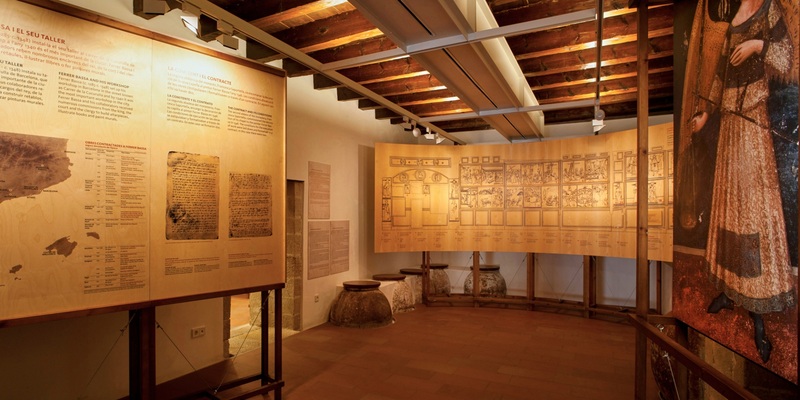 The Barcelona City History Museum wanted to disseminate the results of the scientific studies they were undertaking on the frescoes in the Chapel of Sant Miquel at the Pedralbes Monastery. The space allocated for this exhibition presented a difficulty: the distribution in one of the rooms was extremely complicated due to the existence of old silos integrated into the pavement. We decided to adapt our supports to the distribution and treat the room as an ethnographic space, using an approach based on scenographic resources: perspective and a large curved panel suspended in the air. The first room presents the work, a series of frescoes by the painter Ferrer Bassa that date back to the 14th century. The intention is to introduce the visitor inside an artist’s studio, which resulted in the technical solution we chose: printing directly onto wood panels; workshop materials with natural finishes. The centrepiece is a curved base that is cantilevered at both ends, surrounding the viewer, which contains a schematic and explanation of the painting’s iconographic program. The second room goes more in depth, but it is also more dynamic. Through interactive resources, conceptual maps and an audio-visual display the visitor can discover first how the frescoes were painted (using what tools, techniques, etc.) and how the scientific documentation and restoration process was carried out. The aim is to go into detail, while ensuring it will be easily understood without by non-specialists, and providing the broadest possible dissemination and circulation for the results. The last room is dedicated to detailed views, which can only be seen from the top of a scaffold. It is a way of bringing the paintings closer to the viewer, to fully appreciate the beauty of their execution. The photographs were reproduced in high resolution on retro-illuminated Plexiglas along a perimeter base that causes a mosaic effect of figures and colours.